Authorities have intercepted bombs intended for former President Barack Obama and Hillary Clinton, and several other top political figures were targeted in what authorities are investigating as a connected series of incidents. 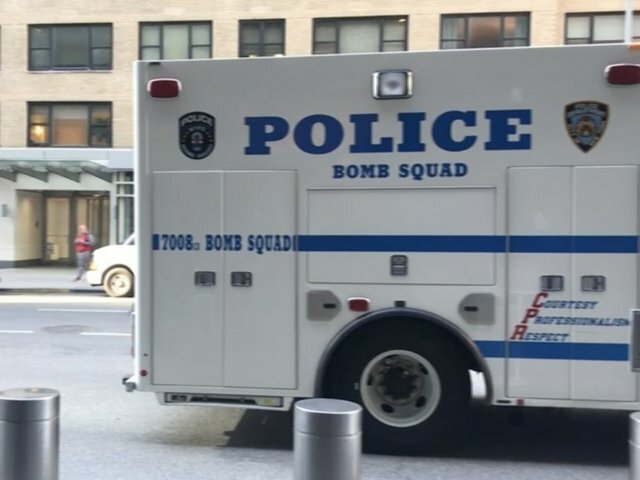 Also, CNN's New York bureau in the Time Warner Center was evacuated after a package containing a bomb, addressed to former CIA Director John Brennan, was discovered, city and local law enforcement officials said. In addition, sources told CNN that a suspicious package intended for California Democratic Rep. Maxine Waters was intercepted at a congressional mail screening facility in Maryland; New York Gov. Andrew Cuomo received what he said was a device at his Manhattan office; and the San Diego Union-Tribune evacuated its building after "suspicious looking packages" were spotted outside. "This clearly is an act of terror attempting to undermine our free press and leaders of this country through acts of violence," New York Mayor Bill de Blasio said at an afternoon news conference. CNN, citing a law enforcement official, was initially told a suspicious package containing a pipe bomb that was addressed to the White House was intercepted at Joint Base Bolling in Washington, DC. The Secret Service, however, later said it had only intercepted the two packages intended for Obama and Clinton and called reports of a package headed for the White House "incorrect." Trump vowed Wednesday afternoon that "the full weight of our government is being deployed to conduct this investigation." "We will spare no resources or expense in this effort," Trump said at the top of his remarks at a White House opioid bill signing event. He said he had just concluded a briefing with the FBI, Department of Justice, Homeland Security Department and Secret Service. The President -- who has recently taken to calling his political opponents "evil" -- called for unity in his remarks and said "we have to come together and send one very clear, strong, unmistakable message that threats or acts of political violence have no place in the United States of America." "This egregious conduct is abhorrent to everything we hold dear and sacred as Americans," Trump said, adding, "We are extremely angry, upset, unhappy about what we witnessed this morning, and we will get to the bottom of it." A law enforcement source said the device found in the Time Warner Center's mailroom is similar to the ones addressed to Obama, Clinton and billionaire investor and major Democratic donor George Soros, which was discovered earlier this week . The package to Brennan was delivered by courier, law enforcement sources said. Neither Obama nor Clinton received the packages sent to them or were at risk of receiving them, the Secret Service said. They were discovered during "routine mail screening procedures as potential explosive devices and were appropriately handled as such," the agency said in a statement. Speaking in Florida early Wednesday afternoon to campaign for Democrat Donna Shalala's congressional bid, Clinton said she and her husband, former President Bill Clinton, were "fine" and praised the response by the Secret Service. A suspicious package sent to the Florida office of Democratic Rep. Debbie Wasserman Schultz was intended for former Attorney General Eric Holder but had the wrong address, two law enforcement sources said. It was returned to the Democratic congresswoman because that was the return label on the package, the sources said, adding that it was the same return address for the packages sent to Obama and Clinton. Packages sent to Soros, Clinton, CNN, Obama and Holder were all sent with Wasserman Schultz's office as the return address in manila envelopes with bubble wrap interior, the FBI said in a statement Wednesday. Each package had six Forever stamps on the envelope as well. It was unclear why the package addressed to Waters was not included on the FBI's list. The bombs show the presence of a sulfur substance, which could have exploded. The devices were pipe bombs and are inherently unstable, and could have been set off just by handling. There is no information that suggests Wasserman Schultz sent the packages. The bomb squad was investigating the package discovered at Wasserman Schultz's office, a local police spokesman said. It was not immediately clear if the package contains a device similar to the others detected around the country. The Soros package was believed to have been placed in a mailbox rather than mailed, a separate law enforcement source said. The package addressed to Waters had similarities to the other suspicious packages, according to two law enforcement sources. One source said that belief was based on the timing, packaging and devices inside the packages, though it was not clear if it was capable of exploding. FBI Director Christopher Wray said in a statement the investigation is the "highest priority for the FBI." "We have committed the full strength of the FBI's resources and, together with our partners on our Joint Terrorism Task Forces, we will continue to work to identify and arrest whoever is responsible for sending these packages," Wray said. "We ask anyone who may have information to contact the FBI. Do not hesitate to call; no piece of information is too small to help us in this investigation." The FBI said it's possible additional packages were mailed to other locations and advised the public remain vigilant. The FBI's counterterrorism investigators are leading the investigation and are handling as a domestic terror matter. The San Diego office of Sen. Kamala Harris, D-California, was also evacuated after "suspicious packages" were found near the building, but they were not addressed to the senator or her office, a spokeswoman tweeted . "There's a number of devices and there's a pattern apparently with them," he said. The NYPD increased patrols at media locations in the city and other potential areas, a spokesman for the department said. Officials from the ATF and Explosives are at the sites of the multiple packages and were at Soros' Bedford, New York, home on Tuesday, a spokeswoman said. The FBI also is involved in the investigation, the bureau said.